Sunday meant another Road Crew event at The Games Keep, in West Chester, PA, with our party finishing Sky ov Crimson Flame by Thorin Thompson. Pretty sure this is going to go down as one of my favorite adventures that I've ever run for Dungeon Crawl Classics. I think it was the blood & flesh magic that really sealed the deal for me. So many opportunities for fun gross-out moments. Great players really helped. Especially young Will. Keep casting those fish themed magic missiles, buddy! Steve James the Ichthyomancer will never be forgotten. Can't wait to see where this goes in future adventures within the Eastern Forest! UPDATE: Okay, this is a "version 2.0" edit of this blog post. I totally forgot to mention how there was a group of D&D 5.0 folks kind of pissed off that we grabbed our table. They were like "what game are you playing?" I responded "Dungeon Crawl Classics." Kind of a dumb question, since both me and Judge Evie were wearing our hats, and pretty much everyone at the table had a corebook. Well, it was around that time that Ryan started sass talkin' the D&D players. I thought we were gonna throw down. Pretty sure I said something like "are we gonna have a dance off, bro?" Crap was tense! I may have also commented as to how our book was a LOT bigger than theirs. A few quick changes to this week's lineup. First, we were joined by Cody's friend Shannon who brought a trip of 0-level characters into the Eastern Forest. 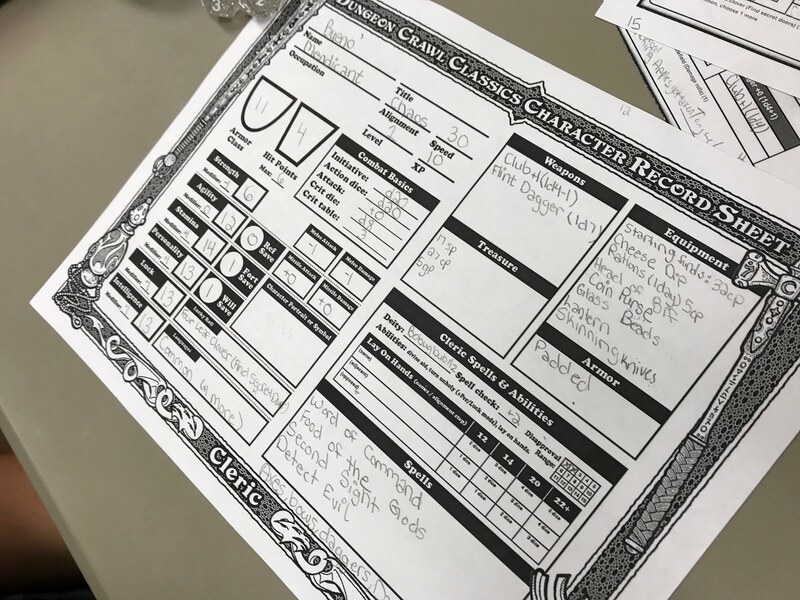 Second, Evie decided to level up Bueno the Mendicant as a Chaotic Cleric of Bobugbubilz..
Bueno, Cleric of Bobugbubilz, played by Evie. 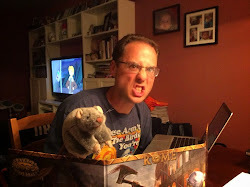 It's always a tough balance: take better notes during the game session so that I can have a more descriptive play report, or run the best game that I can. Honestly, I don't think I can do both, so lately I've been leaning on the latter. But even still, there were some great bright points during this session that I need to cover, and I want to make sure that I jot down enough of "what happened" so that the players can refer to this report later in the campaign. Honestly, that's about 95% of why I write these things. Even back before I was blogging I wrote dozens and dozens of session summaries. For one campaign alone I've got well over 120 pages written, that I have no plan on ever posting. So if you find any of this kind of sloppy I apologize, but you may not be the designated primary reader. Continuing form our last session, the party was in the middle of debating how they were going to ascend to the next level. To put a little "bait" up there of them, I placed all three of Shannon's 0-level characters in the room directly above an already explored balcony. The whines and moans of the poor souls lured the party to climb up and investigate. The room where Twiget, Larkin, and Mallin were discovered was also the lair of a terrible creation known as a Cherub Fusion. This massive, centipede-like, string of winged baby heads had already devoured three of the room's occupants while the remaining villagers listened to the agony. Tonya wasn't about to let the terrible creation eat any more villagers, and she initiated a dramatic battle that ended in sort of a stalemate. The party didn't defeat the Cherub Fusion as much as Bueno cast it away using a Word of Command. Knowing that they only had about an hour before it returned moved the party along. The party mimicked the Cherub Fusion's voice to lure a singing torturer to the locked door. As soon as the torturer was at the door, Tonya and Perrin burst through. The next room was full of agonizing displays. Three villagers shackled to a wall with most of the skin on their legs dangling off. Stacks of skin on a table. A pair of servants armed with knives. The torturer had been dazed by Tonya's door-destruction, but was soon cut down by the warrior as the rest of the team flooded the room. The servants didn't last long either. It should be noted that Bueno cast Food of the Gods during the battle, summoning a giant pile of cooked skin for everyone to eat. I don't think anyone else ate the skin. Two of the shackled villagers remained alive until Bueno the Cleric tried using cheese dip as a salve on one. The remaining villager was healed by Turd Fergeson. Glenn the Miller became Turd's henchman. There were three ways out of the torture chamber. The first was a door to some sleeping cultists' quarters. After nearly disturbing them, Tonya tied off the handle to the door so none of them could flee. The second was another door, leading to a giant egg. The egg had been formed from flayed human skin, and inside was a thin membrane covering a soupy mess of developing winged baby heads. Perrin doused the egg with oil and set it ablaze. Heading down the last remaining hallway, the team eventually found itself in the castle courtyard. Atop a nearby tower, a skinless witch with a villager's face sewn to her own was initiating a ritual, calling down red-blood fire from the skies above. In the center of the courtyard, eight cultists cut their own throats and fused together as a Shambling Flesh Mass. Immediately the party split up. Steve James and Turd Fergeson hung back while Tonya, Lars, Larkin, Twiget, and Bueno went for the Shambling Flesh Mass. Realizing that the skinless witch was his Belesa, Perrin ran up the tower stairwell hoping to save the woman he loved. The Shambling Flesh Mass had nine fearsome attacks: eight were whipping, regenerating intestine tentacles, and one was a bite. Tonya's two-handed sword, and Lars' axe/shield combo did great work on the mass, although the latter almost fell to the beast's wicked bite. Twiget wasn't so lucky. The Shambling Flesh Mass devoured the poor Corn Farmer, turning Henson the Hen into an orphan. While Belesa continued her ritual casting, she kept an eye on the party below. The blood witch, peppered by Steve James' fishy magic missiles returned fire with her own coagulated balls of rage. Steve James was felled by one of the bloody blasts, but Bueno's healing game was on point for the battle. Unfortunately, there was no amount of healing that could fix Perrin's broken heart. When the dwarf reached the top of the tower, he was struck down by Belesa's blood magic. The dwarf collapsed, muttering a few last words before he died. Once the Shambling Flesh Mass was destroyed (Lars got the last hits), Tonya turned her attention to Belesa. The warrior lobbed a grappling hook up onto the tower, catching the witch in the shoulder. As Tonya pulled the witch against the edge of the tower, Turd Fergeson made it to the top and opened up the box containing Belesa's original face. The face flew out of the box, replacing the dead villager's face mask on the witch's head. Immediately Belesa's skin began to grow back. She regained some of her memories and was confused. Utterly confused. What had happened? Why was she hear? Why is there a grappling hook in her shoulder?" At that point, just as Belesa stopped resisting, Tonya gave one final yank, pulling the woman from the top of the tower and into a forty foot fall to her demise. As she rolled over, the body of Perin slipped from the tower as well, landing right next to his lost love. The party took what they could, gathered up the few survivors, and headed back to Reed. "Magical eels though." - Steve James doesn't need to cast his fish-based, Rope Work spell, but the allure of the eels is just too strong. "How sticky is my cheese dip?" - Evie ponders using the congealed substance as "skin spackle" to heal one of the flayed prisoners. "That's good, he almost croaked!" - Rob goes for the amphibian one-liners to describe Bueno's frog-based healing of Lars. "I'm breaking up with you." - Perrin's last words, as he was shot down with hardened blood bolts by Belesa. "There's always gonna be a face-off." - Ryan had a ton of these one-liners today. This one perfectly described the visage ripping theme of Sky ov Crimson Flame. With Belesa the blood witch dead, what other threats lurked in the Eastern Forest? What were Lars' plans for Atma-khanjr, the demonic bone dagger that the dwarf had taken from Belesa? Twiget, killed by the giant fleshy, intestine-tentacled mass in the center of the castle courtyard. Perrin, nailed with a hardened blood bolt, cast by his lost love Belesa, blood witch of the Eastern Forest. 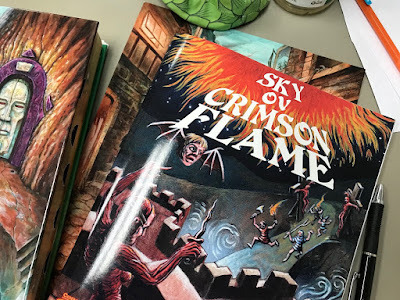 We're either going to explore more of the Eastern Forest within Sky ov Crimson Flame, or perhaps, The One Who Watches From Below.